BOSTON – APRIL 8, 2019. Just yesterday, FOUR PAWS safely evacuated 47 animals from the Gaza Strip, making it the largest rescue to date for the animal welfare organization. The rescue mission was fraught with challenges, having almost ended before it began due to border closures and escalating violence in the region. Despite setbacks, the team achieved the impossible. Most of the animals have been brought to Jordanian wildlife sanctuaries but today, two of the rescued lions fly to South Africa. Both lions will live in species-appropriate enclosures and receive specialized veterinary care at FOUR PAWS’ Big Cat Sanctuary LIONSROCK. -Robert Ware, Executive Director of FOUR PAWS US. Preparing for the mission was preceded by several months of preparations and negotiations. The team spent almost four days, beginning April 4th, to conclude negotiations and finalize the logistics of such a large transfer. With the final approval to move forward, the team quickly went to work. “The last few weeks have been very intense for our team and have brought our team to its limits. To examine and load almost 50 animals in just a few days was a huge challenge, but to save lives and provide better futures, it is all worth it." The animals were loaded into their transport crates on April 6th and then the FOUR PAWS team began the approximate 186-mile journey to Jordan early morning on April 7th. When the team arrived at the Erez border crossing to Israel, a logistical challenge awaited them. The vehicles transporting the animals had to be changed so all crates were unloaded and re-loaded onto a new truck at the Israel-Gaza barrier. Flanked by the Israeli army, the journey to the Jordanian border continued. "Thanks to the cooperation of all authorities, it was possible for us to bring the animals safely out of Gaza. From Israel to Palestine and Jordan, it was impressive to see how these three nations worked together for the animals from Rafah." 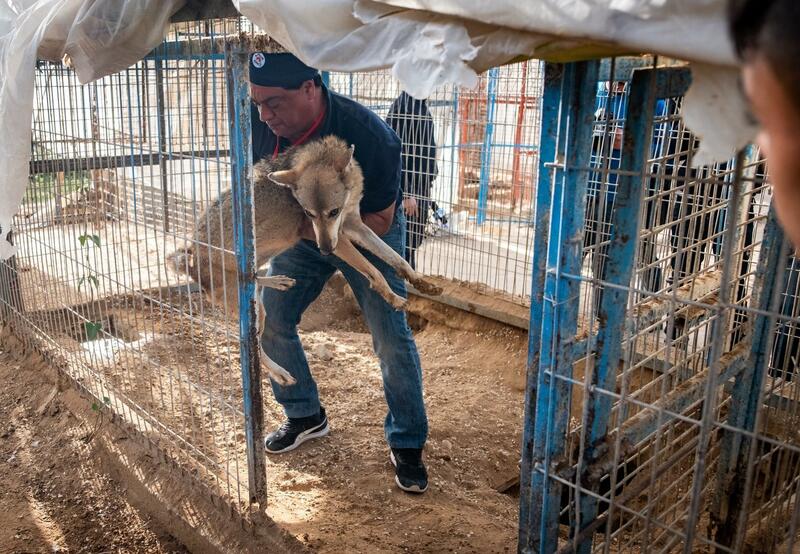 In the late evening, FOUR PAWS arrived with the animals at wildlife sanctuaries, about one hour away from Amman. Throughout the course of today, the animals will be released into their new, species-appropriate enclosures. For two older lions, however, the journey is not over yet. Today they fly on to South Africa, where they will find their final home at the FOUR PAWS Big Cat Sanctuary LIONSROCK. American journalist and businessman Eric S. Margolis financially supported FOUR PAWS in the urgent rescue of these animals. "I did not hesitate to support the brave and valiant efforts of FOUR PAWS again. A well-orchestrated rescue, down to the finest details, has ensured a new life for the 47 animals brought to freedom from the Rafah zoo, in Gaza. Some good news indeed." Margolis’ passion for animals and their well-being was the driving force behind the Eric S. Margolis Family Foundation. The foundation is dedicated to supporting organizations who advocate for and rescue abused and neglected animals while ensuring they are provided with lifelong species appropriate care in sanctuary. Margolis previously supported FOUR PAWS in its rescue mission to Aleppo, Syria in 2017 and is dedicated to giving animals in need around the world, a new life. In addition to the public support of this mission, the French animal welfare organization, Fondation 20 Millions d’Amis, played a major role in this mission. FOUR PAWS has been active in Gaza since 2014 and has already evacuated and closed two zoos – Al-Bisan Zoo and Khan Younis Zoo – in the region. FOUR PAWS remains the only international animal protection organization that has been given such access to the Gaza Strip.